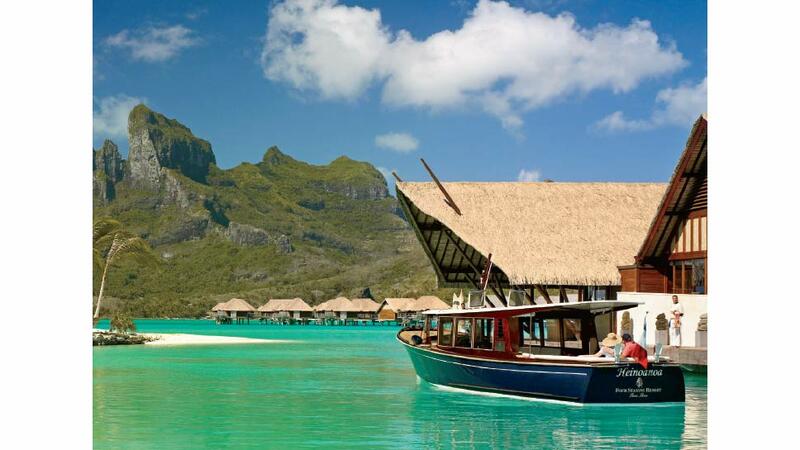 Bora Bora is a celebrity playground and a top spot on most bucket lists. Its allure stems in part from its unmistakable and breathtaking beauty, soaring mountain peaks, crystal blue lagoon, and luxurious overwater bungalows. So, why wait? Make this island paradise your next destination. As you would expect with a Four Seasons Resort, no detail is overlooked. Upon arrival at the Bora Bora airport, your jet lag is eased when a resort employee greets you by name and drapes your neck with a fragrant lei. After collecting your luggage and boarding the Four Seasons yacht, you will have your first introduction to the multiple shades of Bora Bora’s breathtaking waters. Bora Bora locals lovingly refer to this vista as “Fifty Shades of Blue”—a nod to the high numbers of honeymooners visiting the island as well as a salute to the water’s spectacular hues. 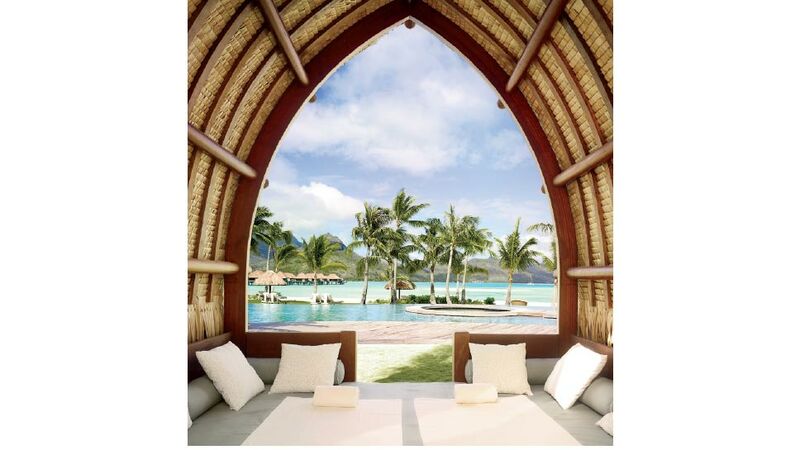 Four Seasons Resort Bora Bora offers the ultimate in island luxury. Arriving at the Four Seasons, your personal concierge greets you with “Welcome Home” and escorts you to a golf cart. As the driver whisks you off to your bungalow, you catch the first glimpses of the pool, tennis courts, spa, and chapel all set against the magnificent backdrop of a turquoise lagoon crowned by Mount Otemanu. The lush green hills of this volcanic mountain dramatically rise from the lagoon’s depths and jut heavenward. 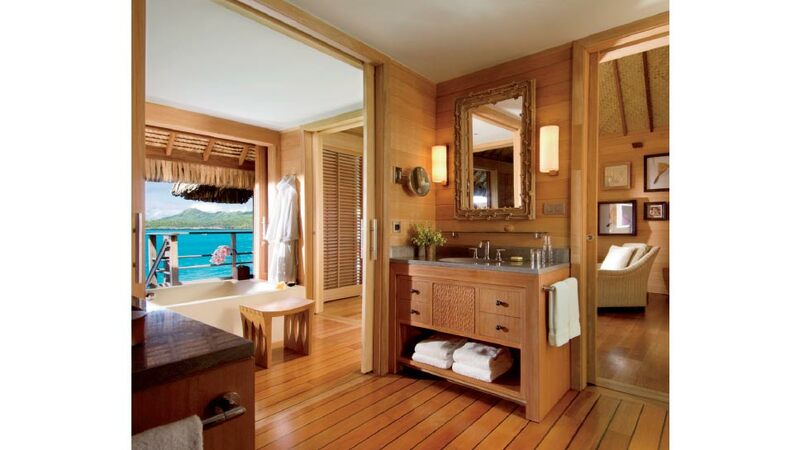 Your overwater bungalow suite offers the ultimate connection to the outdoors as three of its walls slide open to views of the sparkling lagoon or soaring mountain. The bedroom, anchored by a heavenly Four Seasons custom-made bed and capped by intricately woven ceilings, features glass floor panels. A spacious deck provides a perfect launch pad—you won’t be able to resist taking turns jumping from the deck and swimming under the glass panels for pictures. After a day full of fun, the quiet murmurs and dancing reflections of the lagoon provide the perfect backdrop for late afternoon naps. Napping, however, may be a second choice once you are beckoned by the bevy of resort activities. Snorkeling in the lagoon sanctuary is a must. More than just a fascinating snorkeling spot, the lagoon is also a research haven with pockets of coral reef. A marine biologist is available for private tours and even grafting demonstrations. The sanctuary is connected to the outer lagoon, so over 100 species of fish including octopus and eagle rays come and go as they please. Feeling active? Paddleboards, kayaks, and jet skis await you. Feeling mellow? Opt for a leisurely float to a private island on one of the resort’s inflatables. Missing your exercise routine? Savor ocean views from the workout facility or join a water aerobics class in the lagoon. Kids in tow? They will love the Kids For All Seasons Tamarii Club featuring an indoor area with playroom, video games, outdoor playground, and splash pad. 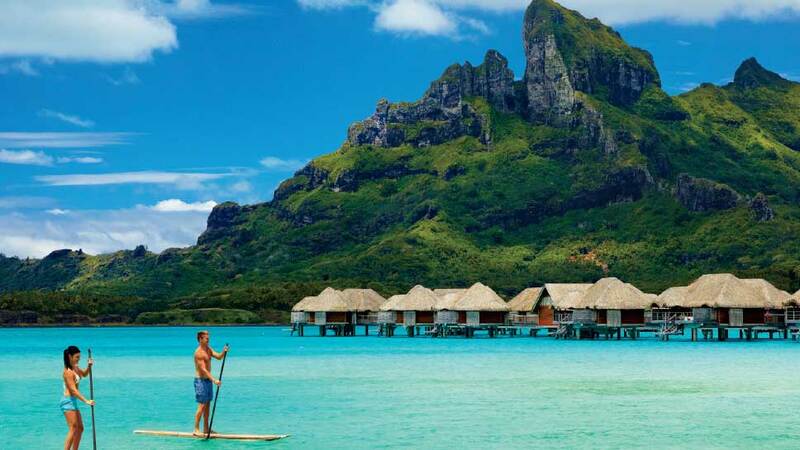 If you wish to venture into the Pacific Ocean, Four Seasons Resort Bora Bora offers endless excursions. A must for the adventurous is the Ray & Shark Snorkeling Safari. Taking off in an outrigger canoe, you speed toward a day you may never forget. First stop is a swim with blacktip reef sharks and stingrays. Arriving at the second stop, you’ll notice the water is a much deeper blue—this is the coral reef garden with an extensive variety of colorful fish—look out for the moray eels! Back on the boat you’ll fly across the water in search of a manta ray as your host strums the ukulele. Once a ray is located, jump in to the lagoon to watch as this prehistoric-looking creature glides deep beneath you. More excitement awaits during another stop where you swim in the Pacific Ocean with 15-foot lemon sharks and more blacktip reef sharks. After everyone returns to the boat, you witness a chill-inducing shark swarm as the host tosses food scraps to the voracious eaters. The last destination is a private island (motu) where the hosts prepare an authentic Polynesian meal served on tables placed in the water. As you dine from large plates made from woven leaves, tiny curious fish dart around your feet hoping for a stray morsel or two. The adventure culminates with a lively show and tales about island history. Like its extensive menu of activities, Four Seasons Resort Bora Bora offers a wide array of resort dining options. A day in paradise is best started with a hearty breakfast at the open air Tere Nui. Each morning an endless array of goodies from tropical fruit to poached salmon to delicate pastries are offered alongside coconuts with straws. Arii Moana is a romantic and elegant setting with beautiful views of the lagoon and Mount Otemanu. The restaurant’s Polynesian and French-blended cuisine emphasizes fresh seafood and succulent meats. Be sure to pair your meal with a vintage wine from their extensive cellar. If you are in the mood for a more casual setting, the Fare Hoa Beach Bar & Grill is an excellent choice. Dig your toes into the silky white sand as you dine on flavorful dishes such as the Spiny Lobster Cobb Salad paired with a signature tropical cocktail. The aptly named Sunset Restaurant & Bar offers a relaxed spot to toast the day’s end while savoring sushi and Asian-inspired dishes. The resort’s weekly Polynesian Dinner and Show offers family-style dining accompanied by an unforgettable show of dancing, fire, and music—be sure not to miss it! Everything about Four Seasons Resort Bora Bora is relaxing but a visit to the Spa takes relaxation to an entirely new level. 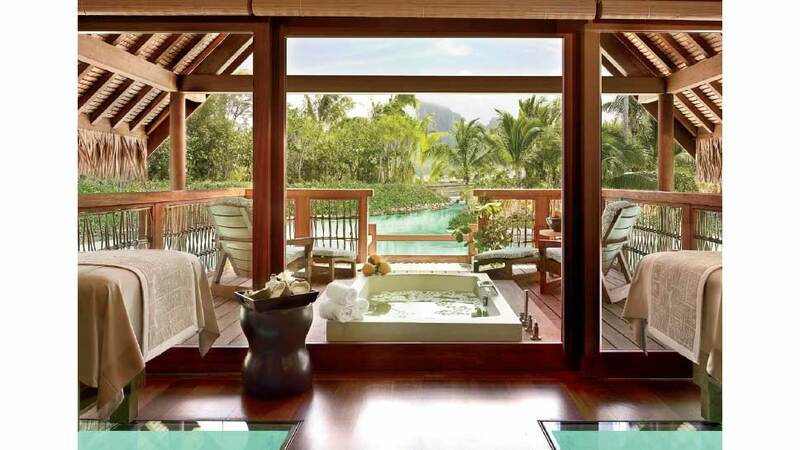 The Spa’s vitality pool presents an unparalleled view of the lagoon and Mount Otemanu. Be sure to take a dip before and after your treatment. The two-hour Kahaia Haven Ritual is a must. As you listen to the ocean’s rhythmic sound and inhale the scent of native vanilla, the treatment begins with the exfoliating Kahaia body scrub (using black pearl powder), followed by a massage with an oil of your choice, and concluded with a holistic de-stressing facial. After such a treatment, you will surely feel that all in the world is righted. End each glorious day on your bungalow’s deck gazing at the thousands of stars in the Milky Way—nature at its finest. 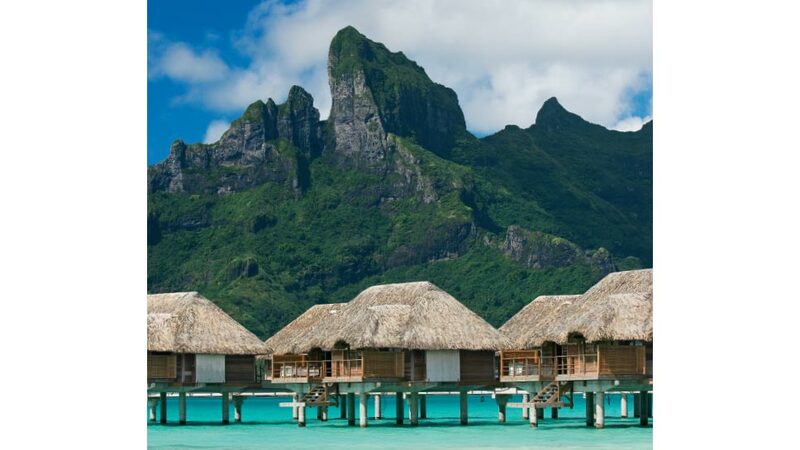 Upon leaving the tropical paradise—with the Milky Way in mind—you’ll rate Four Seasons Resort Bora Bora not with 5 stars, but with 5,000 and hope to say “la ora na” (hello in Tahitian) again soon. For more information about Four Seasons Resort Bora Bora, visit fourseasons.com/borabora.